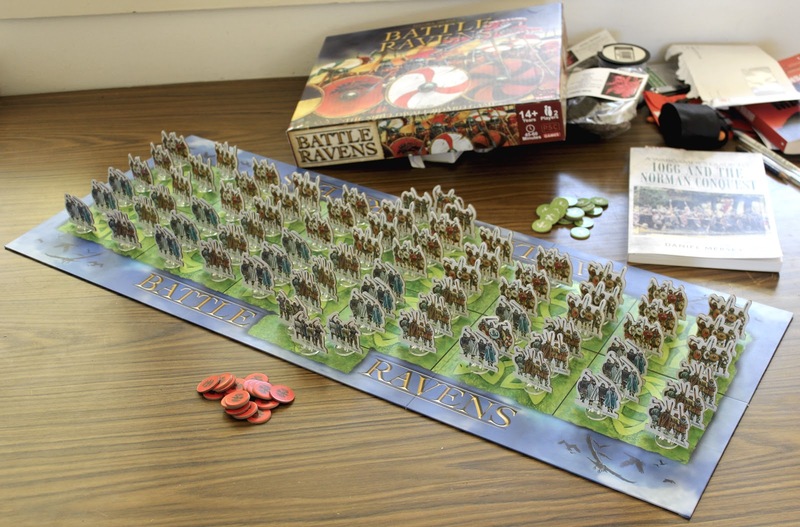 Last night we played our first game of Battle Ravens, the recently released shieldwall boardgame by Dan Mersey. It was really good fun - attrition in the shieldwall. I was the Norse and attacked repeatedly to little effect. The Scots were a little more canny and saved their Battle Ravens until the Norse used all of theirs, then attacked to greater effect. Each player starts with 20 Ravens and these are used to move, attack or defend individual units. The aim of the game is to break your opponent's shieldwall by capturing three of the six areas on the board. Attacks are rolled with normal dice and a 4 or 5 is a hit and a 6 a double hit with Hirdmen worth two hits and the Bondi one. Thralls allow you to reroll a failed attack. Blocking the attacks works in the same way. At the end of the turn once both players have used all their Ravens you start again, returning Thralls to the board and players alternate placing Ravens. If a player has an area captured, with all units removed, the opposing warriors move into it and play no further part in the game. The losing player then removes a Thrall and three Ravens from their hand for each area captured. It proved to be a slippery slope for the Norse in our game and it wasn't long before the victorious Scots had easily captured three Norse areas. I'm looking forward to my next game and will try the Tactic Cards, which reflect the historical tactics, each army has ten of these and five are chosen randomly to use in a game. Thanks Michal, it was a fun, quick game and has quite a few variations as well. Thanks Ray, I think the Tactics Cards for the armies will be interesting to try out. Sounds like a good game,I've read a few write ups and they all seem positive and of course you could replace the card markers with some figures...! It is great fun Iain and only takes about an hour to play. We played two games last weekend with the Tactic Cards and they definitely enhance the game. I've ordered the Norman and Welsh armies. You could definitely play it with figures,15mm would fit on the gaming board but 28mm you need a bigger board. All rights reserved. Content may not be reproduced, in whole or in part, without prior written permission. Bolt Action Campaign started - Ostfront! Inanna. Ishtar. She’s every woman. First Unit of Hoplites done now to do More!